My Father’s Mother was a wonderful cook. She sure had plenty of practice since she cooked for 7 kids and lots and lots of grandchildren and great-grandchildren. She cooked with lard, bacon, and browns eggs. She was a frugal, homesteading, real food organic long before these movements were started. There was always plenty of homemade food for everyone. One of my favorite parts about visiting Grandma was that she always had lots of baked goods ready to go. Her specialty was pies. She made some really delicious pies. They always had spectacular fillings and perfectly formed crusts. Her pies were like beautiful works of art. One of my favorites growing up was always rhubarb pie………..not strawberry rhubarb, just rhubarb. My husband and I always look for rhubarb pies when we are out. They are rare to find because they can be quite tart. My husband’s grandmother also made rhubarb pies so this is a memory we have in common. Fast forward to my recent trip to the Farmers’ Market…………I am always excited to see what is in season and cook with these ingredients. It is a great way to always be trying new recipes. As I walked through the market, I kept seeing rhubarb over and over. The beautiful green of the rhubarb had me reminiscing about Grandma’s pies. I haven’t eaten any rhubarb in quite a few years. My kids didn’t even know what it was. I was excited to share some of my favorite stories and flavors from my childhood. I really had a taste for her pie, but unfortunately I am not a pie maker. Thankfully, I spend a lot of time looking at recipes (I have to do something while waiting for dance class to be over). I remembered seeing Snack Girl’s recipe for Baked Rhubarb Compote. Perfect! It was super quick and easy to make and tasted just like the pie filling I remembered in my Grandmother’s pies. It would be perfect paired with homemade vanilla ice cream or maple whipped cream. I modified Snack Girl’s recipe a bit by adding some fresh strawberries. I really wanted to maintain the purity of the rhubarb, but decided to add the strawberries to sweeten things up as I introduced rhubarb to my children for the first time. I also swapped out the sugar for honey. This is a great way to Juggle Real Food and Real Life. I always recommend using the best ingredients you can find. 2 Cups Chopped Fresh Strawberries. 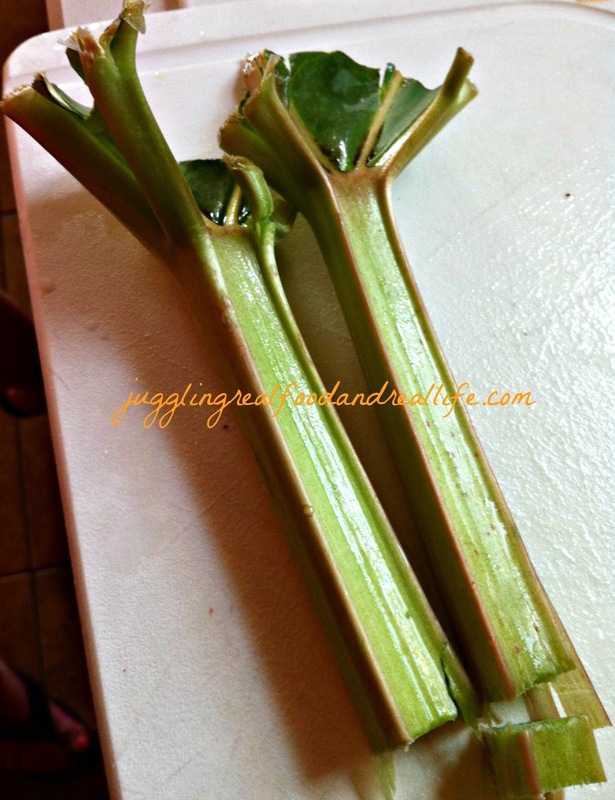 Cut the ends off of each stalk. Make sure the stalk is squeaky clean. Slice into 1 – inch pieces. Cut at a slight angle. Spread jam on the bottom of a 11 X 13 pan. Pour honey over the top. Cover the dish with aluminum foil and bake for 25 minutes or until the rhubarb is tender. Serve with homemade vanilla ice cream or Maple Whipped Cream and fresh strawberries. I hope you enjoy this Baked Rhubarb Compote as much as we did. I know there weren’t any leftovers! Do you have any childhood favorite recipes that you would like to make? Don’t lose them. Make sure you gather the recipes and share them with your family. Food is one of my favorite ways to share love across the generations. You can read more about how I feel about Family Recipes in this earlier post. This looks really good! I've never had rhubarb, can you believe that!? I can believe it Paula. I'm on a mission to let the world know that rhubarb is delicious. LOL! LOL! Kim. Rhubarb certainly does NOT taste like celery, but as my daughter pointed out to me….it is stringy like celery. Thanks for stopping by. I hope you come back to visit often. I'm so glad I stopped by today! I have three huge rhubarb plants in my garden now (thanks to my wonderful farmer-husband! ), and am quite a novice when it comes to cooking with this! Looking forward to trying this, and following your blog with Bloglovin'. I have never eaten rhubarb! I need to try it! I didn't even know you could eat green rhubarb! Whenever I get it, it's awlays pink! This looks delish either way 🙂 Thank you so much for linking up with me this week at Tasty Tuesdays! I’ve pinned this & shared it with my followers! Please be sure to stop back by the party and check out some of the other links!